How did Who magazine slip up in such an unfashionable way, publishing Carl Williams gossip under a suppression order? It deserves this week's Wankley, writes Patrick Tombola. Why is it that audiences are so obsessed with the spectacle of the public death? Carl Williams death interested us because we are so fearful of addressing our own mortality, writes pyschotherapist Zoe Krupka. Putting Carl Williams on the front page of the Herald Sun outraged at "benefits" he was receiving was a mind-blowingly stupid idea and it was no surprise he was killed on the same day, writes Lionel Elmore. Carl Williams may have been a ruthless killer, but we don't execute criminals in this country, so his murder was still wrong -- even if it feels a little bit right, argues John Birmingham. AFL has always been intrinsically linked to the underbelly of Melbourne. Why? The answer is obvious: gangsters and footy players are very, very similar. It's all money, women and violence, writes Jamie Johnstone. Did the Herald Sun kill Carl Williams? In the filthy waters of the state of Victoria, the media will have to move carefully indeed to be part of the solution, rather than part of the problem. Take the case of Carl Williams. 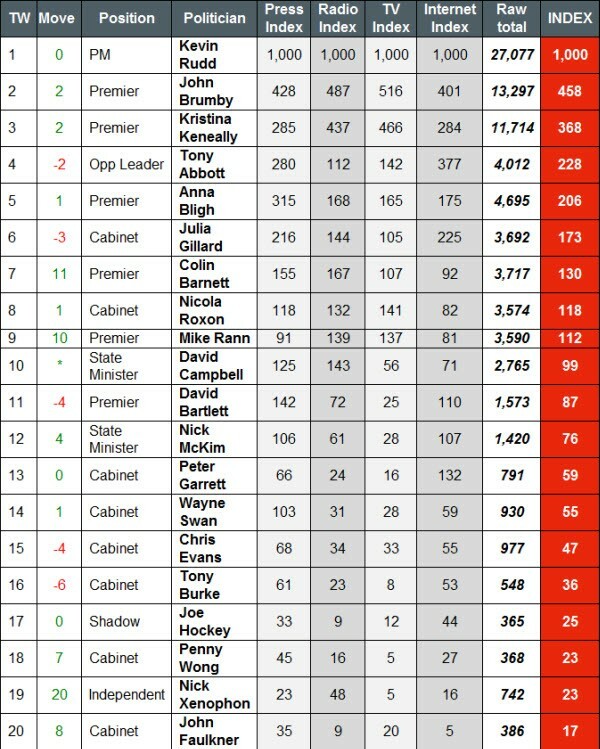 It was all health and all Kevin Rudd fighting the Premiers for the whole week, with Victorian Premier John Brumby getting nearly half as much coverage as the PM, while Tony Abbott slid down two spots. 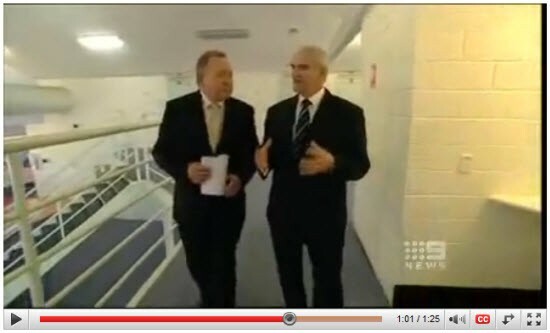 Tony Martin was at the blood bank when news of Carl Williams' demise unfolded. Apparently the gory death of a bloody murderer is far less interesting to people who are up to their armpits in blood every day. Just after 2pm yesterday AAP broke with the news that Carl Williams was suspected to be dead. Cue the beginning of the hysterical and saturated media circus coverage of his death.